The Dutch Baker's Daughter: Tri-Tip Hoagies with Sweet Heat Slaw....and a Saucy Mama Giveaway! Tri-Tip Hoagies with Sweet Heat Slaw....and a Saucy Mama Giveaway! I started with a bottle of Saucy Mama Sweet Heat Marinade---just the sound of it was yummy. Take a look at the bottle. Since the weather is just starting to get nice, I really wanted to make something on the grill. Have you heard of Tri-Tip? Oh, if you are from the West Coast, I'm sure you have. It's a little scarce here in Minnesota, but I managed to find some at Costco. Tri-Tip roast or steak is the triangular piece of meat that sits on the bottom of the sirloin﻿. It is pretty lean, so it lends itself well to a marinade. Perfect for some Sweet Heat, no? Place the coleslaw in a large bowl. Mix the mayonnaise and 1/4 cup of Saucy Mama Sweet Heat Marinade in a small bowl. Transfer the mayo mixture to the coleslaw and mix well. Refrigerate until needed. Put the Tri-Tip in a gallon sized freezer bag with the remaining marinade. Let this sit at room temperature for about 30 minutes (or refrigerate overnight and let it sit at room temperature for 30 minutes). In the mean time, heat a gas grill to medium-high or light the coals in your charcoal grill and arrange them around the perimeter of the grill. Place the marinaded Tri-Tip over indirect heat and cover the grill. Heat for about 15 minutes on each side or until the internal temperature is 125-135 degrees F.; remove to a platter, vent with foil and allow to rest for 10 minutes. Slice the meat against the grain in thin slices. While the meat is resting, brush each cut side of the hoagie rolls with olive oil. Grill until golden. Layer each hoagie roll with Tri-Tip slices and top with coleslaw. Truth be told, I should have taken it off of the grill a few minutes earlier---I like medium rare. This was perfect for the hubby, though. Whatever you do, don't overcook or the meat will be dry. I find the marinade to season the meat perfectly, but if you need more salt and a little pepper, be my guest. 1. Post a comment on this blog entry. 2. "Like" the Dutch Baker's Daughter on Facebook (if you are already a fan--just tell me). 3. Share this blog post with your friends on Facebook, Twitter or by email and just let me know--this is honor system unless you are already a friend (feel free to look me up on Twitter---DutchBakerGirl). 4. This giveaway is only open to US residents who are 18 years of age or older. That's it--pretty easy, no? I'll pick a winner on May 22* using Random.org. In the mean time, I'll be thinking up some other Saucy Mama good stuff. Contest ends at 11:59 PM, May 21, 2011. That Hoagie looks fabulous! I know the dressing would be fabulous with the cabbage! YUM! I have been a FAN of you and anything you do with cooking for quite a while now! Heading over to Merry Cooking Contests Facebook wall to yak about your giveaway! This sandwich looks delicious, Cathy! I've never had tri-tip before, but I'll look for it at the store. You're one saucy mama! I can't wait to try your hogie. Maybe I'll grill the tritip for memorial day. The sauces do look interesting. I always like a good recomendation! The sandwich looks great! I will have to wait until I'm on my home computer to "like" the Dutch Baker's Daughter on Facebook. This looks delicious! I have never heard of this brand either, being from Iowa! This looks delish, Love the logo on the sauce - so cute. What a perfect upscale sandwich for summer time! I shared this post on my Facebook profile, would love to share the sauces with my parents! I shared this post on my Twitter profile! Would love to share these sauces with my bro and sis-in-law who are new parents! That's weird! My post didn't show up - instead I went to a page for ITT Technical Institute?!?!? Let's try this again ... I "Like" The Dutch Baker's Daughter on Facebook. Wow - the sandwich looks delicious. I love tri-tip and appreciate seeing a recipe featuring that cut of meat. Cathy the sandwich looks yummy and as soon as I receive that box of this deliciousness (I'm a firm believer in positive thinking)I'll be making that cole slaw. You know I already like everything you do...just wish ya did it closer to me, and I would be happy to share your recipe with all my friends...I like so much they should also know how great you are! My husband just loves to cook tri-tip on the grill. He also loves to put slaw on his sandwiches, he would love a big ole bite of this sandwich. Went and checked and as I had thought, of course, I already like you on FaceBook. Now I will go post this wonderful recipe and giveaway. 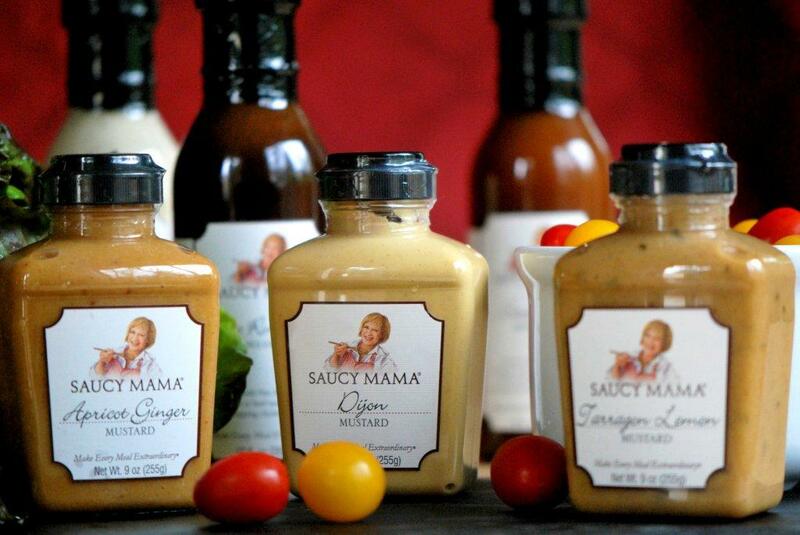 I have never tried a Saucy Mama product - the Sweet Heat looks delicious. I will have to tell my friends about your blog. The pumpkin snowballs you have on your blog look delicious. I love anything with pumpkin and would love to have one with a big glass of milk! Just saw you were a PBO finalist in 2010 - I bet that was a fun experience! Hi all--I noticed that some comments are missing because of the Blogger shut-down. I'm not sure if they will be back, so I hope I don't miss anyone. I remember seeing Carol D, and Patti T and Angela--I see you had some other comments, so I know you shared with friends. Angela, I don't have a way of getting ahold of you should you win. Could you email your contact info to cathy.wiechert@gmail.com? Thanks, everyone! I'd love to try the sauces on a grilled pork loin or chicken kebabs.